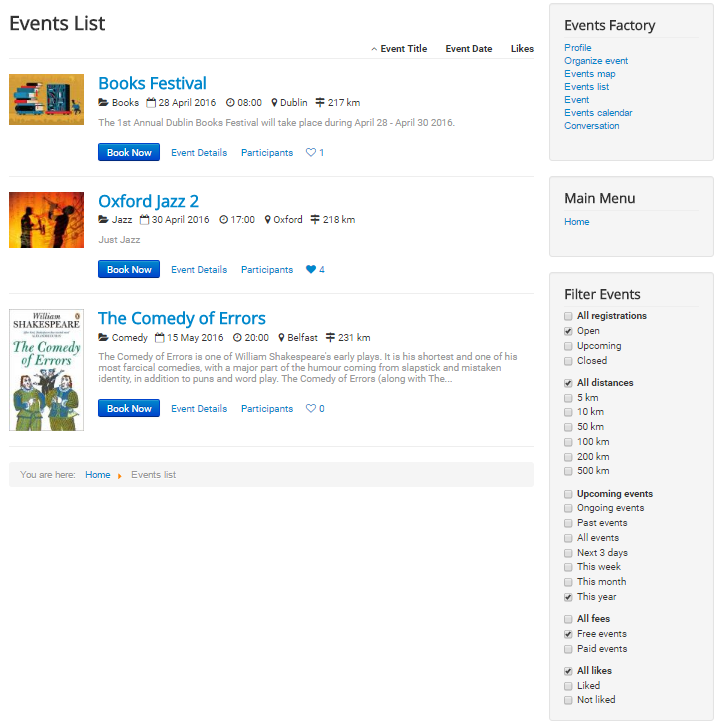 Click on Events list from the Events Factory menu and it will open a page listing all the upcoming events. 1. Event Title: you can arrange events alphabetically by their titles. If you want to reverse the order, click again on Event Title. 2. 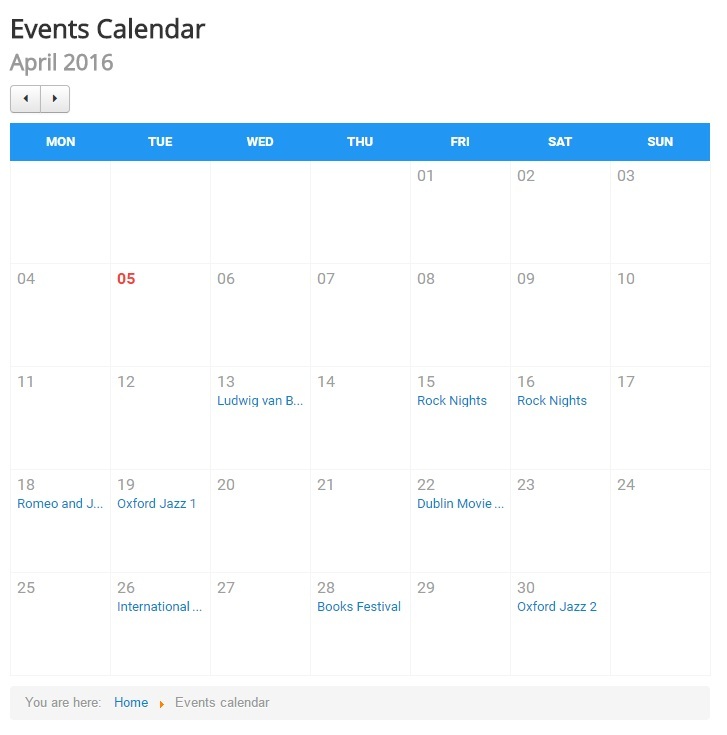 Event Date: you can also choose to sort the events ascending or descending by date. 3. Likes: using this option, the events will be sorted ascending/ descending based on the number of likes received by each event. *You can use only one sorting option per display. If you want to display a more detailed search, you can add criteria using the Filter Events module. Take a look below to see an example of the Events List sorted alphabetically from A-Z (ascending) by Title, using the selected options from the module. (!) For more information about the Filter Events module check our page Events Factory - Modules Guide. Access this section if you wish to display the events using Google Maps. 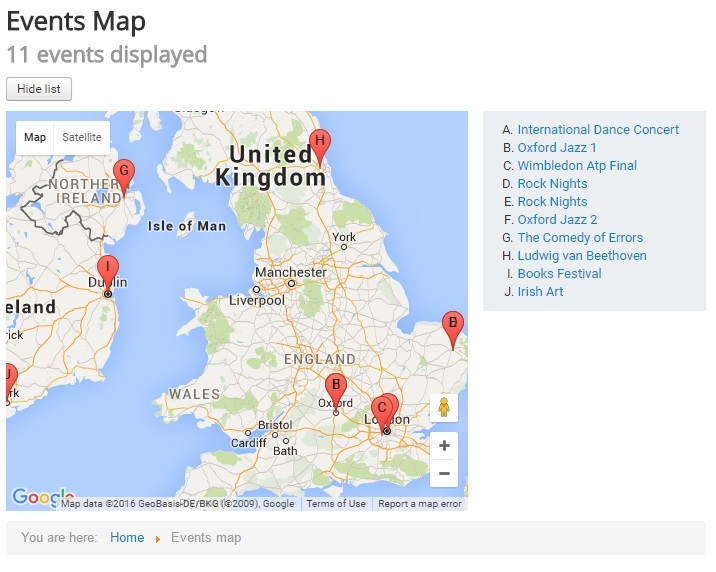 Click on the Show List button and you will see the upcoming events name from the selected area. Also you can use the Filter Events module to restrict the searching area. All the published events (upcoming, ongoing, passed, cancelled) are displayed on this monthly calendar. Use the navigation buttons to change the month or year. Click on an event if you want to see its details. In this section, you can choose an event which will always be displayed on the site and it can be seen by everyone. The event must be set by the site administrator from the Events Factory menu (backend: Menus→Events Factory→Event) and edit the Event item. Here you can rename the item title and you will select the event that you want to be displayed from the drop-down list from the "Event" field. The selected event (with all details) will be displayed on the frontend when you access the Event from menu.